“There are Hybrids and there are Turbo Hybrids” intones the commercial for VW’s latest offering in the Hybrid field, concluding that this Jetta is “The first Hybrid that you’ll actually want to drive.” For once, the advertising is right. Given this Jetta’s proclivity for balanced handling, gratifying surge, and seamless transitions between gas and electric modes, the Jetta Hybrid is way more fun to drive than a Prius or a Volt. 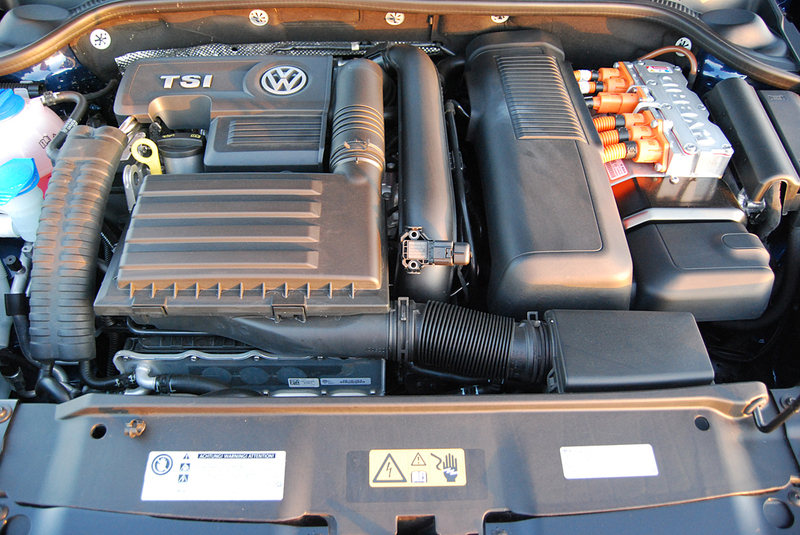 This Jetta’s turbocharged, 140hp, 1.4 liter, inline 4 will stuff you smartly into your sport seat when the auxiliary electric motor kicks in to generate a combined output of 170hp and 184 lb.-ft. of torque. 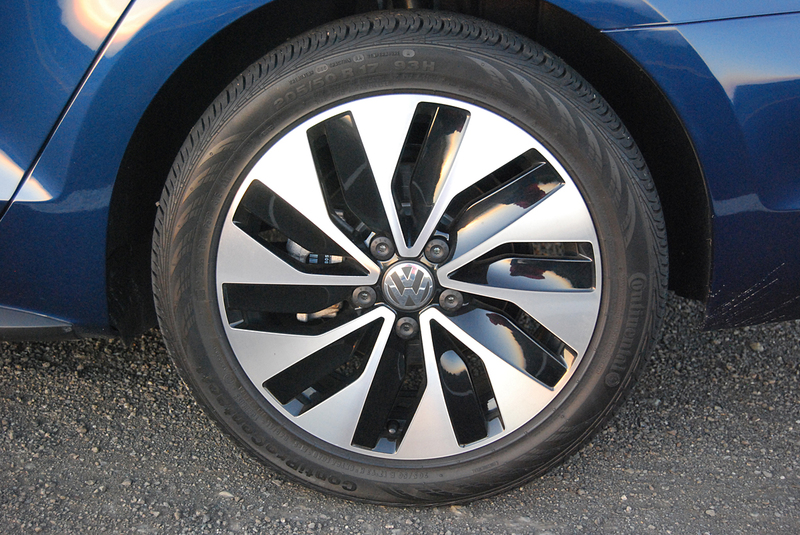 Despite the fact that VW has slapped a set of ultra hard (Treadwear rating: 500) ContiSportContact 205/50R17 tires on distinctive looking sluice-gate alloys, the Jetta Hybrid grips the pavement surprisingly well. Just one quick blast through a set of S-curves will convince you that the Jetta is geared more to driving fun than any other Hybrid currently available. Adding to the enjoyment is a real, 7-speed DSG transmission, with manual override available at the flip of the stick. With most other Hybrids, you must contend with the disconcerting whine and bumpy shifts of a continuously variable transmission. On the minus side, the Jetta’s regenerative brakes feel grabby and imprecise, a first-generation Hybrid trait that other brands have long since eliminated. Thankfully, VW has spared you the self-congratulatory encomiums so prevalent in other Hybrid instrumentation. You’ll see no falling leaves to document wastefulness here, no confusing charts requiring you to take your eyes off the road. If you need to regale yourself with such corroboration, look elsewhere because this VW barely bothers with such self-aggrandizement. Instead of shrines to virtue, you’ll find a simple 10,000 rpm tachometer, which also doubles as an engine status indicator with colored zones for “charge” (green), “eco” (blue) and “boost” (white). Indeed, the cockpit of the Jetta is pretty much what you’ve come to expect from this company: top quality materials, expertly assembled into an environment that stresses keeping your eyes on the road rather than on the dash. To be sure, there’s a standard touchscreen navigation system, but because that screen does not subsume all other control functions, you needn’t bother with it when you just want to adjust temperature or fan speed. For those needs, VW provides good, old fashioned ribbed knobs that look great, and work better than any touchscreen embedded pictograph. In keeping with the businesslike demeanor of the driving environment, the steering wheel is fat rimmed, with recesses cut at 9 and 3 o’clock for thumb grips. Understated matte aluminum appliqués to the door panels and dash look just right in this Bauhaus minimalist cabin. Of course the bottom line to the Jetta Hybrid equation is neither Euro centric design, nor turbo zing, nor gearbox splendor, but its EPA/DOT Fuel Economy rating of 42 MPG City and 48 MPG Highway. The Combined figure of 45MPG is so good that the government estimates your annual fuel expense at just $1,250. Compared to the average new vehicle, the Feds claim you’ll save $5,350 in fuel costs over 5 years. Our bit to run the Jetta Hybrid dry ran out of time because we simply couldn’t drive enough miles in 1 week to do a real mileage check. Suffice it to say that after driving it almost daily, we still had half a tank left with an estimated mileage range of 250 miles still showing. 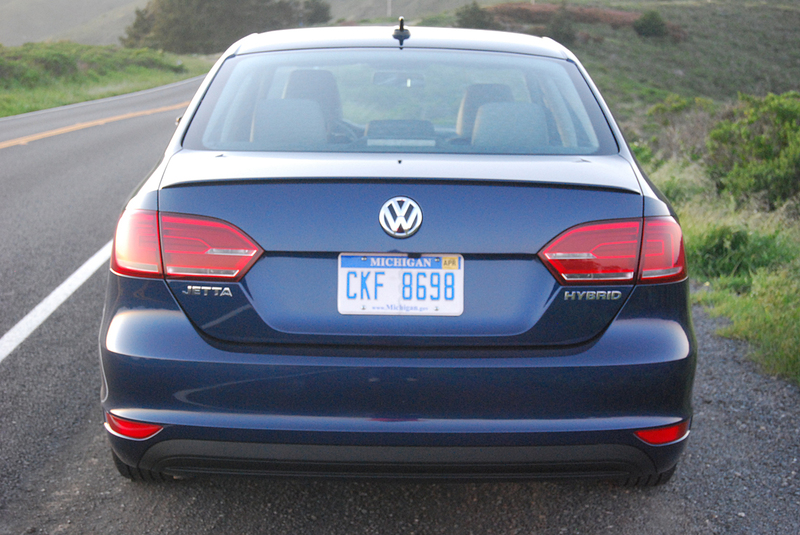 The Jetta Hybrid is a remarkably stout product. 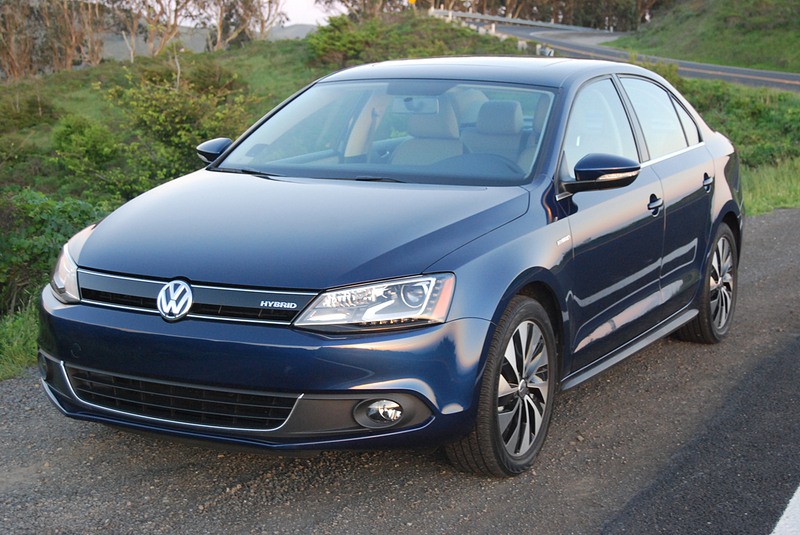 Braking issues aside, it generates the same kind of driving enthusiasm you’ve come to expect from other VW products. There’s a basic honest and consistency at work here that will not disappoint longtime enthusiasts of this brand.